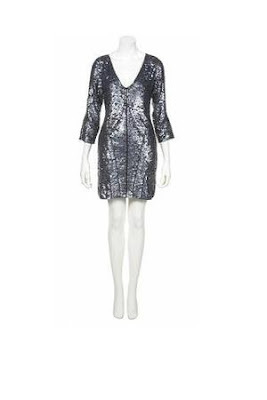 Kate Moss launched her last ever collection for Topshop a few days ago and I had been mulling over getting a piece. The only piece to catch my eye was her limited edition fringed jacket and although I love it, I really don't need or want another jacket, especially at full retail price. I will definitely try to wear it over the holidays and I now don't need to go out looking for that elusive Xmas dress!! What will you be sparkling in this festive season? Aw, if you lived near me, I'd let you wear my Kate Moss fringed jacket from ...whenever that was! Gorgeous, I do love sequins. Fingers crossed you find the jacket at a charity shop in a few years time! WOW, that's marvellous. I also would like to see this on you. I bet you'll look fab. Ciao. A.
Oh my giddy aunt, that is stunning! Gosh, I haven't even thought about my christmas dress for this year! I am extremely jealous of this beauty. I have to say...I haven't been that impressed with Moss's collection this time round!